It’s becoming quite obvious as to why there are no major runaway hits for Android Wear. More specifically, it’s clear why there’s not one smartwatch that people simply “must have”. The reason? 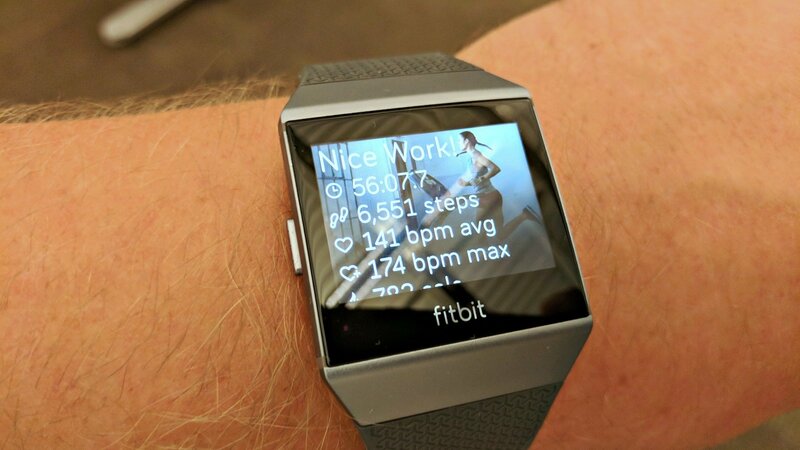 Fitbit and its ilk. I’ve had the pleasure of using various Fitbit wearables over the last few years. Moreover, I’ve also owned and used my share of Android Wear watches, too. And, as much as I love the flexibility and promise of what Google sets forth in its OS, I just don’t wear the devices as much as I should. Instead, I find myself turning to “less smart” stuff from the likes of Fitbit, Samsung, and others. To be clear, it’s not as if these other wearables are necessarily built better or are more fashionable. It’s certainly not as if they have more flexibility or options either. What they offer me, though, is a “good enough” experience that often comes with a more affordable price tag. Fitness and activity trackers have evolved to the point where it’s not just steps, calories, and sleep anymore. Now we can use them for workouts, music, run tracking via GPS, and even mobile payments. Over the years Fitbit has pivoted from one or two models to an entire lineup of wearables with variable features and options. Perhaps more importantly, Fitbit has gotten smarter with each generation, blurring the lines between fitness tracking and smartwatch. Its latest model, the Ionic, is billed as a “motivating timepiece” and is essentially its first foray into smartwatches. Building on its Blaze (read our review), the Ionic is a major release in the era after acquiring Pebble in late 2016. It bears a striking resemblance to its predecessor but it steps things up in terms of functionality. Priced $300 at launch, we found the Fitbit Ionic to be nearly everything we want in a smartwatch. At a minimum, it was everything we need in one. Sold in three color options, you can buy it in Slate Blue/Orange, Blue Gray/Silver Gray, and Charcoal/Silver Gray. We were supplied a Charcoal/Silver option from Fitbit. Additionally, we were sent a set of Midnight Blue replacement leather watch straps. This way we were able to see how flexible the watch is in terms of functionality as well as form. The first thing we noticed about the Ionic is that while it’s quite similar to the Blaze at first blush, there are some subtle and welcome changes. We appreciated that there was a gently slight curve to the design as it wraps the wrist. Most square faced watches can be awkward or come to feel unpleasant over time. The Fitbit Ionic is also a light watch, regardless of which straps you’re using. The default “Classic” plastic bands are just a smidge heavier than the leather but both are comfortable. Included in the Ionic’s box is both a small and large version of the classic band. While you can certainly get away with using the standard straps for all occasion, the leather dresses things up nicely. The perforated leather breathes well; it’s incredibly easy to snap and unsnap the bands. It takes all of around ten seconds to swap out bands. We liked wearing leather most of the day, replacing it temporarily for the trips to the gym. 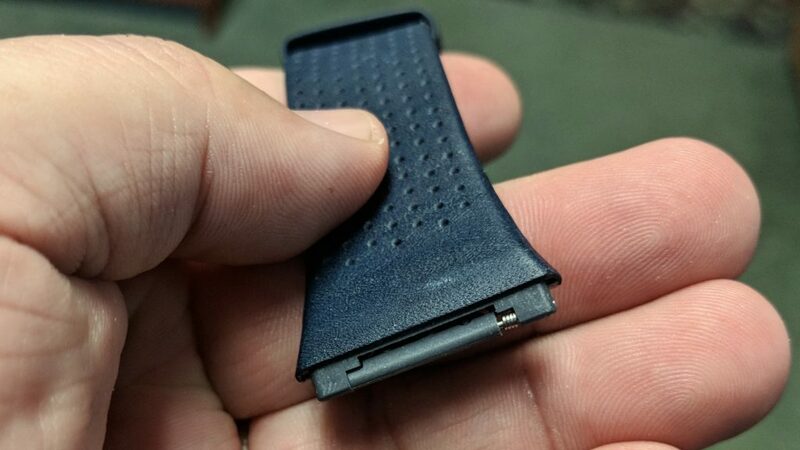 One of the chief gripes we had with the Fitbit Blaze was that it was not waterproof. It wasn’t as if we needed it to track swimming but that would have been a nice touch. Rather, we just didn’t like having to take it off every time we took a shower or expected to get wet. That problem is addressed in the Ionic as it is fully waterproof and also features swim tracking. The downside to wearing the leather band, though, is that it’s not water-resistant or sweat proof. So, you won’t want to take it to the shower, bath, or pool. You also don’t want to get all sweaty from a workout. This is where having the classic band on for all occasions comes in handy. The Ionic is comprised of aerospace-grade aluminum and has very small antenna bands on the sides. On the left side you’ll find one button; the right has two buttons. The entire display is extremely easy on the eyes, thanks to its brightness (up to 1,000 nits) and resolution. Gorilla Glass 3 protects the screen from scuffs and scratches. The buttons stick out from the sides and have a nice textured grip to them. It’s pretty easy to find them when you’re out of breath and want to pause your run. There’s a nice response to all three of them, making navigation pleasurable. Although the screen itself does accept touch for tapping and swiping we did find it a little less responsive than we’d like. This goes double for times when you’re sweaty or the watch is wet. A couple of times we found we had to shake our wrist free of droplets or wipe it against our shirt to get a good, consistent read. 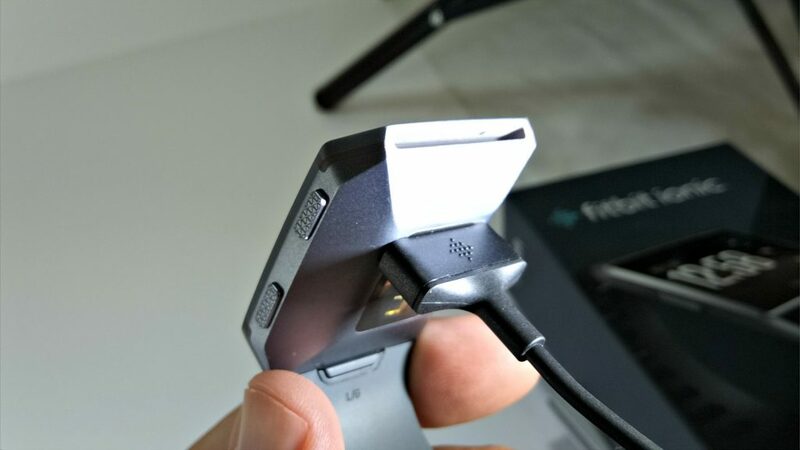 With every different model of Fitbit comes a different way of charging. For the Blaze it was a case of removing the watch from the band and encasing it in a charger. The Ionic has a magnetic charger that attaches itself to a few connecting points in the back. We weren’t totally in love with the setup. Rather than a platter-like connection that you might find with other smartwatches, the Ionic’s charger is almost like a perpendicular plug. The magnet is strong enough to get a bite but disturbing the watch could result in losing connection. On a more positive note, you’ll only have to charge the watch two times a week at the most. 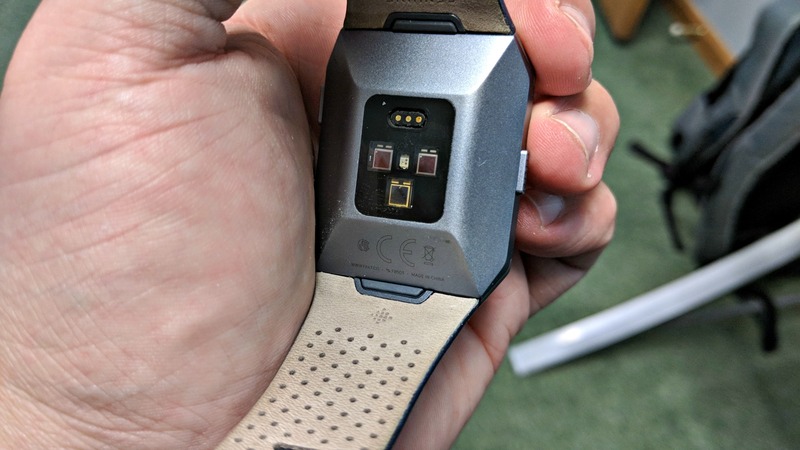 We were impressed with the watch’s ability to hold a charge, especially as we played around with it in the first few days. Between goofing with the watch itself and adjusting things from the app we would have chewed through an Android Wear watch much quicker. We don’t like to have our wrists feel constricted. It’s pretty common for a watch to have a thick or wide band that’s generally comfortable throughout the day. Come night, however, that wide strap can feel like a cuff around you wrist. 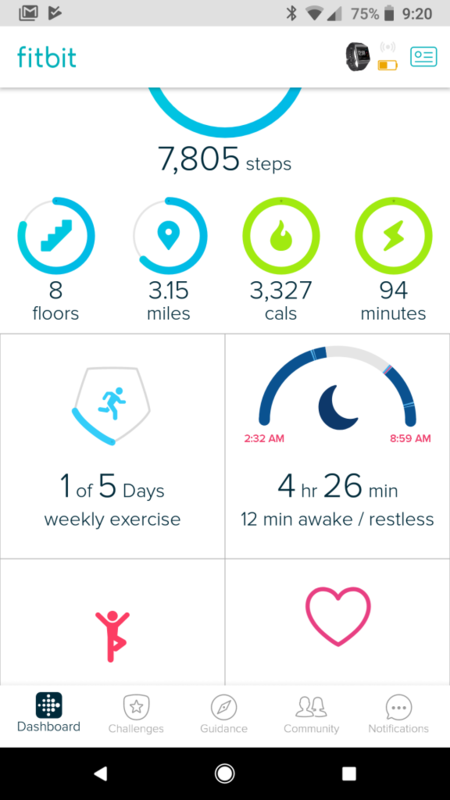 The Ionic, like many of Fitbit’s products, can track your sleep. We were pleased to discover that the watch bands didn’t feel too constricting or obvious. For what it’s worth, the leather has more play to it than the classic band. Generally speaking, it’s easy to forget that you’re wearing the Ionic. As we said above, it’s really light. While it might look like there’s a giant square on your wrist, there’s a taper to the bottom. Indeed, only around 25% of the display touches the arm. This allows for movement in all directions without bunching your skin up or pinching. Aside from the occasional unregistered touch, we liked navigating and using the Ionic. It offers up more than just passive tracking, something that we’ve really come to rely on. To be clear, the watch can be used in the passive manner, but it benefits the user to use the built in features. The Iconic can automatically track exercises and activities; there are numerous coaching features to help guide you on your aerobic or fitness path. On the other end of the spectrum it can also walk you through some breathing sessions bringing your heart rate into line. By default the watch will notify you when it’s time to get up and moving. Sit too long and it will vibrate, gently nudging you to get up and walk around. We appreciate that tracking steps can be monitored in a per-hour basis. It’s one thing to knock out a few thousand over a run but where do your other steps come in? Are you prone to move more during morning or after dinner? The mobile app does a fantastic job of aggregating data over the short and long term to help you along. You can glance at a running log of sleep habits, steps, calories burned, and other details or you can dive deeper into specific days. It’s truly a case of “the more you use it, the better it gets”. The Ionic can also notify wearers of calls, texts, and calendar events. Additionally, set up notifications on a per-app basis. So, if you don’t want every Facebook or Snapchat update to hit your wrist, you don’t have to get them. There’s enough storage in the watch to hold around 300 or more songs. Moreover, it has access to Pandora, without need of a phone. Yes, you can grab some headphones and pair them to the watch so you can get your run on. The built in NFC chip lets you use the Ionic to make mobile payments. 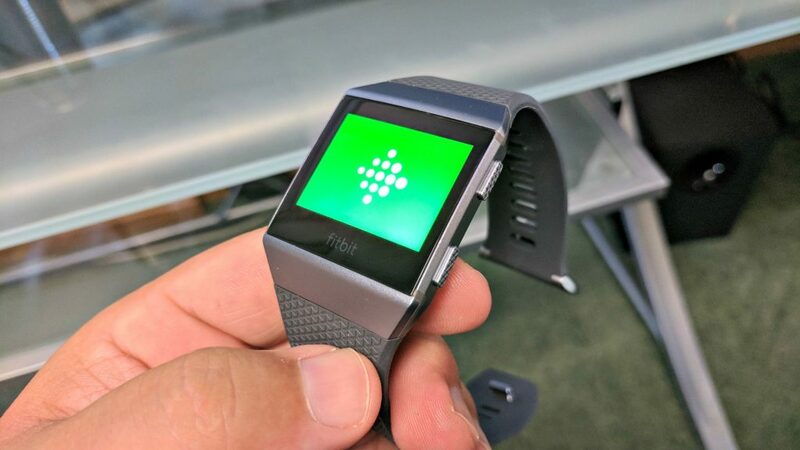 This is a first for Fitbit and one that we liked quite well. It also lends to the whole notion of being able to leave your phone behind. Stop by a gas station or convenience store on your way home from the gym and you’ll be able to tap and pay with the watch. This feature takes but a few minutes to set up on your phone. Although not a first for Fitbit, the Ionic has built-in GPS antennas. You can feel free to run, bike, or walk, knowing that the watch is tracking your whereabouts. This, too, was something we wanted in the Blaze. To be fair, the Blaze would work in tandem with your phone to provide the GPS. Fitbit terms this as “connected GPS”. We did have a couple of instances where the watch would restart or hang up in the three weeks we spent with it. Twice, at the gym, we just happened to look down to check calories and heart rate while on the treadmill, only to find the Ionic was in the midst of a reboot. Not only did we lose the activity we had done up to that point, but we had to restart the treadmill tracking again. Had we not looked down we might not have known it had stopped. Nevertheless, we lost about 15-18 minutes in one run and around 10 minutes in another. A third instance we had was that the watch was seemingly locked up with a dead screen. Taking it off the wrist we could see the heart rate tracker blinking; however, there was nothing happening on screen. Holding down the two buttons on the right seemed to restart the watch without instance. But, again, this was just us glancing down to see the time. How long it was off remains to be seen. Moreover, we don’t know what was tracked up to that point. Those issues aside, we’ve been incredibly happy with the Ionic. Performance was otherwise flawless so we’re hoping this is just a case of bug fixing that comes in a future firmware update. The more we wear a device like the Fitbit Ionic, the less reliant we are on a platform like Android Wear. But, that’s not to say it’s perfect and does everything right. It’s not as customizable as what you’d get in a more formal smartwatch and there are very few “apps” for it. 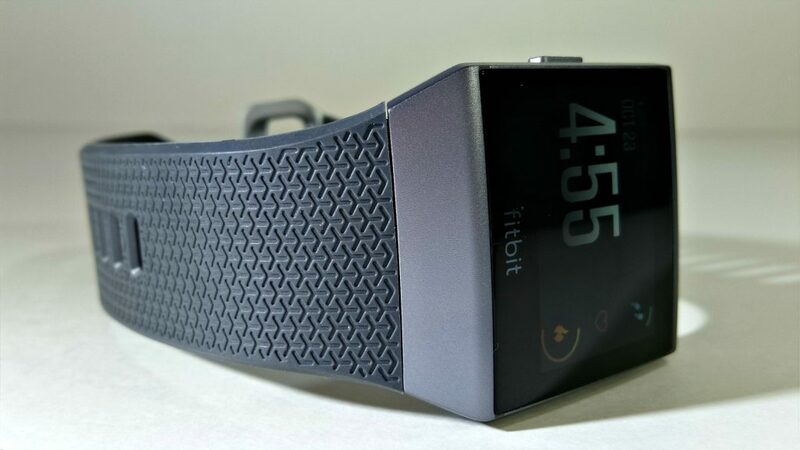 As a product in the Fitbit family, the Ionic is wonderful. It’s priced right and differentiates itself from other models under the brand. There’s enough special here to justify moving up from the Blaze, especially the waterproof protection. 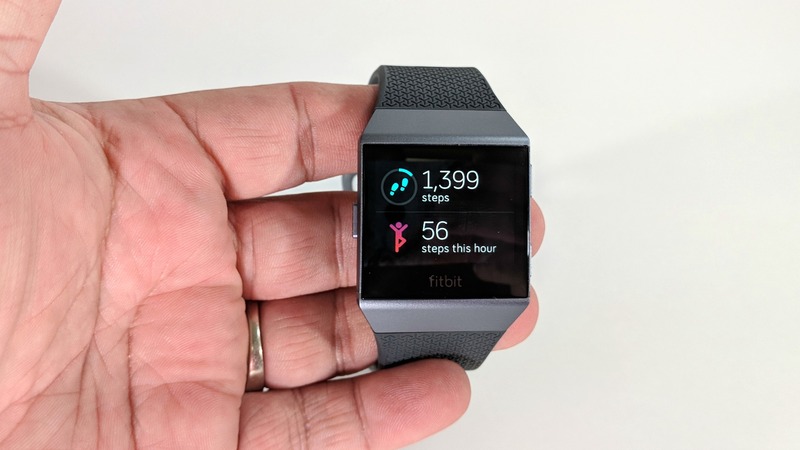 Fitbit has established itself as a premier name in the wearable space, and, by all accounts, this will only help propel it forward. Add in more interoperability with other apps and services, fix a minor bug or two, and you’ve got one killer product. Out of the box, though, we still have no issues recommending the Ionic for interested buyers. 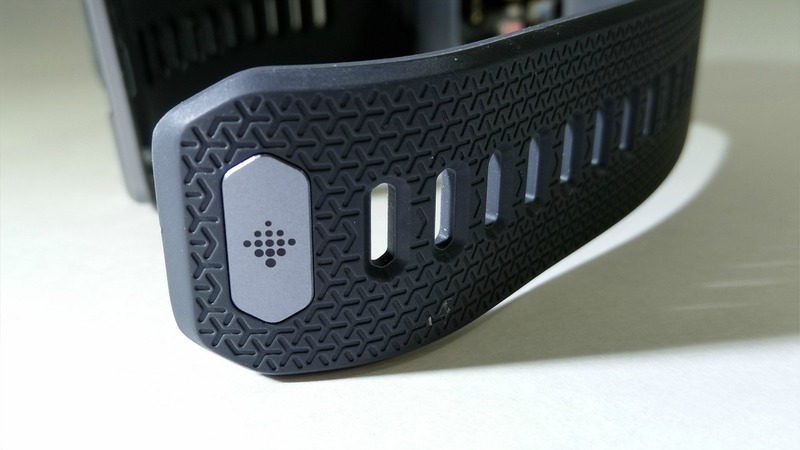 A wonderful wearable for those with an active lifestyle, the Ionic is the most feature-rich product from Fitbit thus far. It's waterproof, features GPS and NFC (mobile payments), and has an incredible software experience. The more you use it, the better it works. You'll be tracking everything you do, including meals, water intake, sleep, and more.